For a decade and a half, the partnership of Michael Powell and Emeric Pressburger illuminated the cinema with an array of extraordinary films. But the massive reputation the team garnered during and immediately after World War II – The Life and Death of Colonel Blimp, A Canterbury Tale, I Know Where I’m Going!, A Matter of Life and Death, Black Narcissus, and The Red Shoes in just five years! went into steep decline in the Fifties. There were no Archers films at all between The Tales of Hoffmann (’51) and Oh… Rosalinda!! (’55), and both of those were disastrous failures, critically and financially. Perhaps to cover themselves in the ultraconservative British film industry, Powell and Pressburger finished their partnership with two conventional war adventure movies – rattling good yarns that, alas, were widely perceived as rattling just a bit too much. The Battle of the River Plate (’56) was a box-office success and had a royal premiere, but it now looks like the corniest of the Archers movies. An account of Britain’s first major naval victory of WWII, it does have the great virtue of showing actual ships maneuvering about in an actual ocean instead of models in a tank – Powell’s main pleasure in directing the movie, one imagines. But this is exasperatingly offset by far too many shots of actors on studio bridgehead sets being doused with water as they strike poses in front of a cyclorama. The local color Powell provides is a bit sticky, too, given that Uruguay, where the German battleship Graf Spee was forced to seek shelter before being tricked into self-destructing, was and still is a nation notorious for its concealment of Nazis. Peter Finch, as the captain of the Graf Spee, manages an impressive performance, but none of the other actors in a lively cast Anthony Quayle, John Gregson, Patrick Macnee, Anthony Newley, Christopher Lee, John Schlesinger in a bit as a German sailor – has much chance to create a real person. The Germans are all decent fellows, really, whilst the characterization of the Brits is entirely on the level of good-show-chaps caricature. Powell seemed rather attached to this movie in later years, but had no love at all for the very last Archers film, Ill Met By Moonlight (’57). “I felt imprisoned by the facts,” he was wont to complain; and there were problems with the script Pressburger provided. Ian Christie’s book about Powell, Arrows of Desire, goes so far as to refuse to list the film as a collaboration at all, his filmography (reproduced, incomplete and inaccurate as it is, in Powell’s memoirs) giving Powell’s name alone as writer, producer, and director. Dissension between Powell and Pressburger coincided with antagonism from the Rank Organisation, which refused them money for color. Once the film was finished, so were the Archers. After Ill Met By Moonlight, then, the deluge. 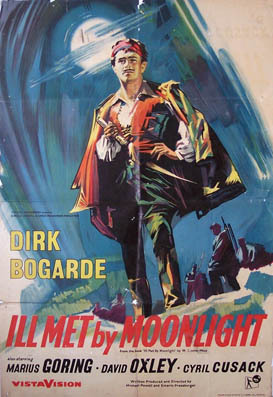 It would be foolish to suggest that the film – miserably renamed Night Ambush for U.S. release and cut by 11 minutes – is anywhere near the level of the team’s masterworks. Even so, it’s more interesting than legend suggests. The (true) story, set in occupied Crete in 1943, concerns the kidnapping of a German general (Marius Goring) by Cretan partisans led by a British officer, Patrick Leigh Fermor (Dirk Bogarde). Film buffs will recall that the real Leigh Fermor was one of the scriptwriters of John Huston’s The Roots of Heaven (also the author of some bestselling travel books). Then again, the film seems to ask, who exactly is the “real” Patrick Leigh Fermor – or the real anyone? Taking its title from a play concerned with dreams and disguises, magic and power, Ill Met By Moonlight is all about questions of identity. Under the credits, we see Dirk Bogarde in uniform; then, unexpectedly, we see him in the flamboyant outfit of a Cretan hill-bandit. A title informs us that Major Leigh Fermor was also known by the Greek code-name “Philidem.” In other words, there are two of him (at least), and on one level the adventure the film is about to unfold reflects a conflict in his personality. It’s a conflict shared, unknowingly, by his Nazi opposite number, the fierce, arrogant General Kreipe (an unlikely “proud Titania,” but it’s true that he “with a monster is in love” – the monster of Nazism). Kreipe’s human side is so rigorously repressed by the demands of war and “glory” that he is genuinely unaware of it; ironically, this humanness, which constitutes the true manhood of this Teuton warrior, is revealed by a boy (equivalent to Shakespeare’s Indian Prince?) – who, in turn, is the most grownup person in the movie. If “Philidem” appears under the credits, caped and open-shirted, a romantic dream-figure out of an operetta or a storybook, he is first seen in the film proper as a coarser, more down-to-earth version of the same thing – an ordinary Cretan peasant in a shabby suit, waiting for a bus. When he makes contact with the Resistance, his personality fragments further. To some, he is the mystical Philidem, Pimpernel of the Hellenes and righter of wrongs. To others he is “Major Paddy,” the happy-go-lucky Englishman of popular movie myth conducting war as if it were a branch of amateur theatricals, a gentleman adventurer relying on breeding to get him through and making fun of the whole business. To Bill Moss (David Oxley), the newly arrived junior officer sent to assist him, he is the cool, fast-thinking professional soldier. And to himself? In his quietly passionate defense of Cretan life and culture, he seems someone else again: a scholar and aesthete outraged by the barbarism and folly of war, and by the moronic arrogance shown by his captive toward the Cretan people. Whatever his persona, Leigh Fermor is a chameleon who never seems to change very radically in himself. Perhaps because he has this quality of seeming all things to all men – and being those things – he remains unfazed by the monolithic might of the German military machine. Fluent in Greek, he can also speak German like a German and is easily able to assume another disguise, that of a faceless Nazi officer. Although he and Moss make fun of themselves – “If only I had a monocle!” muses Moss when Leigh Fermor tells him he “looks like an Englishman dressed like a German, leaning against the Ritz bar” – they are able to effect the kidnapping with an ease that seems appropriately Puckish. General Kreipe is ignominiously thrust onto the floor of his own limousine, gagged, and sat upon by a couple of the peasants he so despises. Kreipe’s rage is compounded by his firm conviction that he has been snatched by “amateurs” – a belief Leigh Fermor and Moss slyly make no objection to, knowing how it will gnaw at his already shaky Master Race self-confidence. Soon, partisans and captive are up in the hills, where they stay for most of the movie (though the biggest of the film’s mountaineering set-pieces, a nocturnal descent through fog, was filmed on elaborately stylized studio sets). Once there, Kreipe determines to leave a trail for following German troops to pick up on – his cap, buttons from his uniform, even a couple of medals from his impressive display of such baubles never realizing that each emblem of his authority is no sooner dropped than it is retrieved by the vigilant Moss. Among Major Paddy’s partisans is a young war orphan, Nico, who has, while shinning up and down the mountains, much occasion to complain of his need of a pair of boots. Nico knows that the cost of a new pair will always be far beyond him; Kreipe, who has been friendly enough toward him in a rather patronizing way, seizes on this need by showing the boy his own impressive footwear and offering a gold coin with which to buy an identical pair. A German gold coin, he stresses, not one of the sovereigns Leigh Fermor keeps a supply of; it is, in fact, a coin the General is known to keep as a good-luck charm. Nico is impressed by the General’s largesse. But, of course, the Nazi requires a quid pro quo. All Nico has to do, when he goes down the mountain, is tell the searching German patrols where the General is, using the coin as a bona fides. But Kreipe has misjudged the boy (indeed, he can be said to have misjudged the whole of the human race): it never occurs to him that the boy will not do what he says. What Nico actually does is simply point the patrols in the wrong direction, leading them into an ambush; the magic gold coin is lucky for the Greeks, not the Germans. This makes the escape from Crete of the Britishers and their ill-met prisoner the easiest part of their long journey. Once aboard a British ship, and naked of the symbols of military power, the General seems a new person – not such a bright man, not such a strong man, but also not such a bad man, either. He is visibly moved by the return of his possessions, especially the gold coin: despite his genuine pleasure in Nico’s company, Kreipe had assumed that the boy, like every non-German, is someone who can be bought and sold, and that “friendship” had been merely his gift, and not a privilege from which he might derive spiritual benefit rather than tactical advantage. The very simplicity of Nico’s ruse in deflecting rescue was the, final humiliation, the last stage in General Kreipe’s lengthy symbolic disrobing – which is precisely why his possessions can now be given back to him. If he started this modern midsummer night’s dream as imperious as Oberon, he ends it as foolish as the donkey-headed Nick Bottom. But then, Bottom the simple weaver is always better-liked by everyone than the unearthly and tyrannical monarch of Shakespeare’s enchanted forest. And Patrick Leigh Fermor, aka Major Paddy, aka Philidem – and, if you stretch your imagination just a smidge, aka Robin Goodfellow? – what of him? In the film’s closing moments, he is far from being self-assured intellectual or dashing amateur adventurer or legendary outlaw of the hills. He’s just a tired man who wants to go home and rest up. “How do you feel?” asks Moss. “Flat” is the reply. “You look flat!” says Moss. 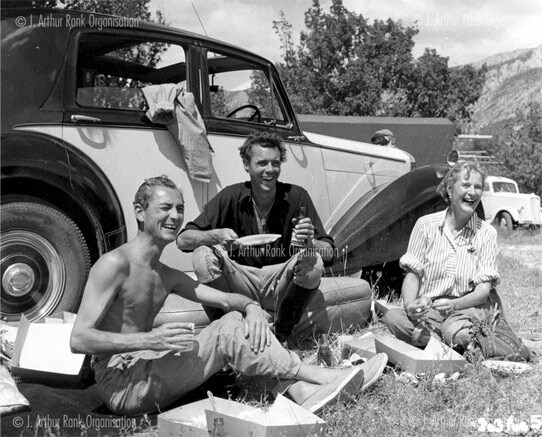 “I know how I’d like to look …” murmurs Leigh-Fermor wistfully. Moss knows what he’s going to say, and joins in the litany: “Like an Englishman dressed like an Englishman – and leaning against the Ritz bar!” It’s easy to imagine them ordering drinks at that renowned watering-hole with all the suavity required by this little fantasy. Still, the film’s last images of Crete receding in the distance, until all we can see is the sea, suggests that maybe Major Paddy’s heart is really back in those hills in the “fair and fertile” land that has become as much a Powellian landscape of the mind for us as the studio-built Himalayan convent of Black Narcissus or the monochrome Heaven of A Matter of Life and Death. And, as we depart both Crete and this film, we may reflect that being “dressed like an Englishman and leaning against the Ritz bar” would, for Patrick Leigh Fermor constitute yet another disguise. After all, he was Irish. … now watch the movie trailer. 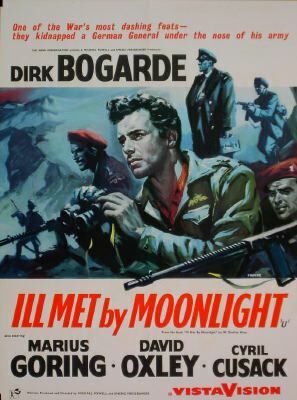 This entry was posted in Ill Met by Moonlight and tagged Crete, Emeric Pressburger, Greece, Ill Met by Moonlight, Major General Heinrich Kreipe, Michael Powell, Patrick Leigh Fermor, Second World War, SOE, Special Operations Executive, William Stanley Moss on August 7, 2011 by proverbs6to10.